We had reported on this in detail here. Janta Ka Reporter, took a completely unverified bit of information that Aamir Khan had adopted 2 villages in Maharashtra and published it as gospel truth. This was picked by almost entire media blindly without checking for the authenticity. Eventually it was found out that the news was untrue. Read our detailed report which shows how low the standards of reporting are at Janta ka Reporter. The source of the information will shock you. We had a separate report on this. Almost the entire media reported the above when the truth was completely different. The order of the administration only banned “exhibition or advertisement whether by way of posters or in the newspapers“ and not scantily dressed women themselves. The order itself had no mention of miniskirts but for some reason the Indian media made this into a banning miniskirts issue. Here, media chose to spin the incident where 3 dalit boys who were accused of robbery were stripped and beaten by a mob. Somehow our media sleuths determined the castes of the people in the angry mob and labelled them as “upper castes”. Soon news was spread that upper castes beat dalits and this became the main focal point. Police, on their investigation confirmed that some of the people who beat the boys were also from lower castes. The police report said, the arrested suspects belonged to Meena (ST) and Dhakad (OBC) communities and the crime was not at all caste related. This news was reported in mid-April with great fervour by many media houses. It was a source based piece which claimed that the long in the works deal for Rafale Jet with France had finally been sealed. Media even reported the figure for which the planes were being bought, with NDTV quoting $8.8 Billion. It was only recently, in Rajya Sabha that the defence minister clarified that no deal had been finalised yet and they were still working on it. He also accepted that looking at the detailed media reports, even BJP’s IT cell got fooled with this news. We had a separate report on this. This was another example of poor malicious reporting from Janta ka Reporter. Kanhaiya alleged that a Manas Deka had tried to “strangulate” him in a plane. The police eventually found this claim to be a lie. Based purely on Kanhaiya’s statement and the name of the “attacker”, portals like Janta Ka Reporter ran a story that this Manas Deka was a BJP coordinator. In fact, Manas Deka who was a BJP office bearer was a totally different person. He even had his mobile number online and a simple call for confirmation would have given a factual position. We had a separate report on this. In a tweet which was later deleted by CNN News 18, they claimed that HRD Minister Smriti Irani “spoke out” on Kanhaiya being fined and Umar Khalid being rusticated. Irani, quickly took to twitter clarifying that she had not spoken about any specific student and wonder whether her views would be taken out of context. Even the interviewer Vir Sanghvi tweeted that Irani had in fact not spoken about any student in particular. Anchor Bhupendra Chaubey stepped in too to reassure the minister even as CNN News 18 slyly deleted the tweet. 8.The Indian Express: BSNL offering 20GB broadband for Rs 50. This viral rumour about BSNL offering 20GB broadband for Rs 50 was first started by The Indian Express. This led to memes being circulated on social media and many other sites covering this news. Finally BSNL, in an official statement, had to clarify that BSNL had not officially declared any offer like 20GB 3G data for Rs 50 and neither did the company intend to do so. At this point, The Indian Express changed the headline of their post from: “BSNL 20GB 3G data offer for Rs 50 could help win new customers” to “BSNL is not offering 20 GB data at Rs 50, but users can share mobile data”, completely changing the story. 9. ABP News: Ganesh Joshi, BJP legislator, attacked and severely injured Shaktiamaan the horse. In a post in March itself, we had written how videos show that the BJP legislator did not hit or injure the horse. The horse’s leg was never hit by anyone but it got hurt when it hit a metal rod. After the initial noise, even some media outlets accepted this fact. Still, ABP News continued to peddle the above lies. Later ABP News changed the post and removed the above part. We had a separate report on this. BJD MP Baijayant Panda took to twitter to explain this lie. Relying on old data, and without bothering to confirm with the MP himself, the above media house published news that the MP had under-utilised his MPLAD funds by a huge margin. Panda even wrote to them setting the record straight but they did not publish the rebuttal. Hence Panda put out the latest utilisation certificate on social media showing more than 99.5% utilisation of funds. The Indian Express which was the only Indian media house working on the Panama leaks documents along with many other international business houses, and which had claimed to do in depth research on this topic, floundered in their own coverage. In the initial report, they claimed that the Ashok Malhotra who was named in Panama leaks was a former cricketer. But on the next day, in the back-pages, they issued a correction saying the Malhotra who was named in the Panama leaks, was actually a Kolkata based businessman. At the peak of the unrest at NIT Srinagar, media reports came out with the news that NIT Srinagar students had demanded a temple inside the campus. This was completely untrue. Nor was it seen in the video of demands raised by the students, nor was it mentioned anywhere in the formal demands letter sent to the HRD Ministry by the students. This news was probably based on the tweets of an unofficial handle which claimed to represent NIT Srinagar. The Indian Express reported the above news on April 4th. And a few days later, once CPI(M) clarified, they issued a small correction saying that Bajoria was in fact never a CPI(M) member. Indian express, in a tweet first claimed that Sajjad Lone was a BJP leader. Later when it was pointed out that Sajjad Lone was in fact not a BJP leader, Indian Express deleted the tweet and corrected the error. In a tweet, CNN IBN (now known as CNN Network 18 News) claimed that in the Panama Leaks over 500 Indians were named for “tax evasion”. It is true that the names of many Indians cropped up but no one at this time can say whether any tax was evaded or not. The leaks only mentioned names of people who were associated with off-shore companies. Even the source report clearly stated that it is not illegal to hold offshore companies and many such companies could have legitimate purposes. Hence IBN jumped the gun in labelling those named as “tax evaders”. PTI got the amount raised via sale of Uday bonds grossly wrong in their headline, which led to many media houses copying the same. This inspite of the fact that the 1st line of the report clearly states the figure as “Rs 98,959.96 crore” and not 100 times that figure i.e Rs 99 lakh crores. 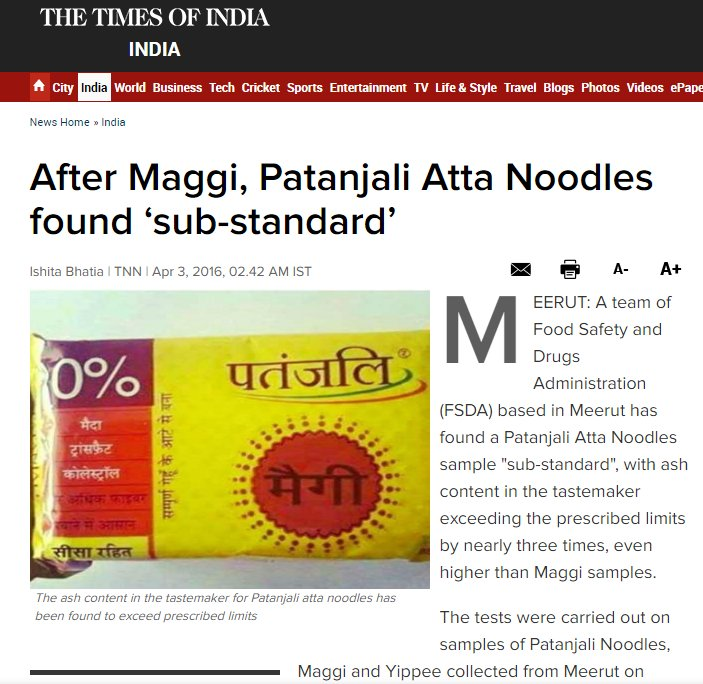 In a report, Times of India used a fake picture of Patanjali noodles which has been circulating on soical media for long. 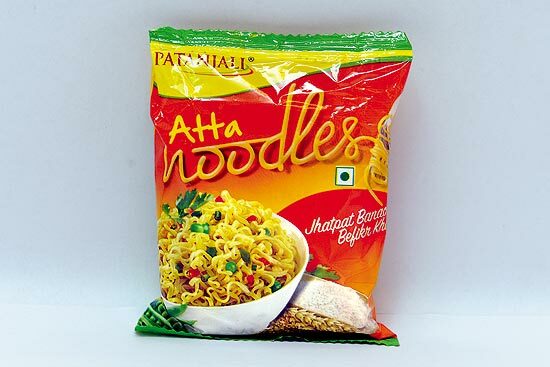 On the packet, the words “Maggi” are mentioned, which is legally not possible since Patanjali cannot use a trademark of Nestle. The real picture is this. This was reported by Times of India on 6 April 2016. Soon they issued an apology stating the the reports are incorrect. Unfortunately, she did succumb to her injuries, but almost a week later. The above news was reported by IndiaToday but within a few hours, Salim Khan tweeted that the news was false and that he had never been offered the Rajya Sabha seat. He also said it would be a great honour of he was actually given the chance, but he would have think about it considering his age. Correction: An earlier version of this article identified four of the women on the stage as being Muslim. The panel was made up of four Muslim-born women and moderator Barkha Dutt.